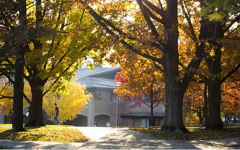 Calvin’s nursing program is one of the predominantly female programs on campus, with just 14 out of the 64 students in the program being male. The gender disparity in nursing is due in part to the fact that nursing is a historically female profession, although recent advances in nurses’ education and increases in pay have made the profession more attractive to men. 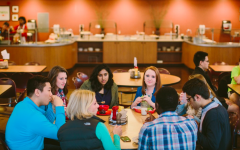 Yet despite the gender gap, men in Calvin’s nursing program don’t feel discriminated against. 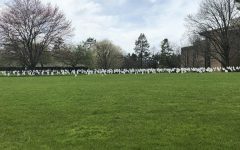 According to professor Jesse Moes, the only male professor in Calvin’s nursing department, the number of male students in the nursing program has stayed relatively constant over the past few years, with men comprising 15 to 20 percent of each cohort. However, a few decades ago there were proportionally fewer men in the program than there are today. In comparison, only about 10 percent of all nurses in the United States are male, according to US Census data from 2013. Of that 10 percent, most work in the emergency department, critical care or other high-paying nursing specialities. “There are multifaceted explanations for the gender gap in nursing,” Moes explained. 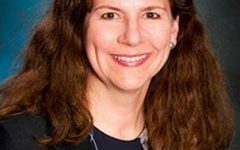 “Much of the work associated with nursing has been attributed to traditionally female characteristics, such as caring, empathy, and compassion,” Moes said. 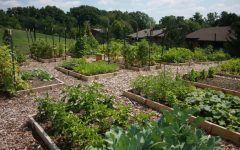 Caring activities may also be viewed as less important and assigned to individuals with less power and prestige, who are historically women in many societies. Over time, however, the level of training and education nurses receive has improved dramatically, Moes noted. As a result, nursing as a profession has become more prestigious and well-paid, making it more attractive to men. Throughout the past few decades, the number of men in nursing has more than doubled, according to data from the 2010 U.S. Census. 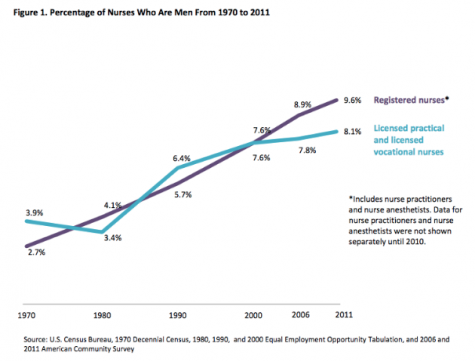 Only 3.9 percent of registered nurses were male in 1970; by 2011, 9.6 percent of registered nurses were male. Moes noted that, despite the increase in practicing male nurses over the past four decades, “many men face stereotypes in nursing school and [in their careers].” Some people make assumptions about male nurses’ sexual orientation or assume that male nurses are unable to obtain more advanced medical degrees, such as an MD. In addition, men can be viewed as insensitive to female perspectives, or are assumed to be more physically capable for activities such as lifting patients. 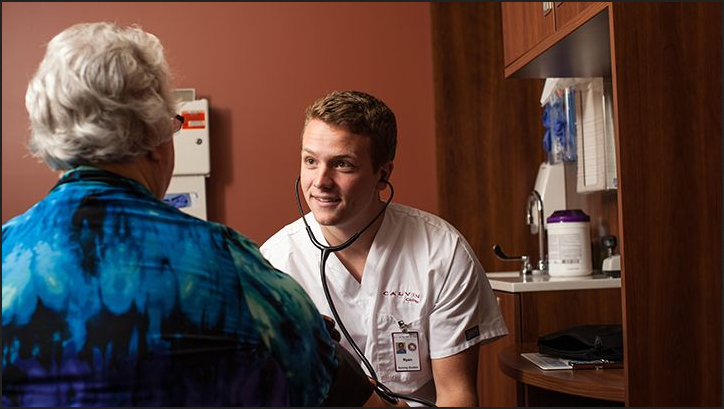 Joshua Casey, a junior nursing major, recognized the stereotypes that male nurses face. Casey noted that although the nursing program is predominantly female, he has never felt discriminated against. Kyle DeWeerd, a junior nursing major, agreed. DeWeerd decided to pursue nursing after volunteering in an emergency room during high school. He enjoys the opportunity to help people and appreciates the Christian liberal arts perspective that Calvin’s nursing program offers. “I love interacting with people. Nurses are unique in that they get to operate in the medical side of things while also getting a very interpersonal experience. 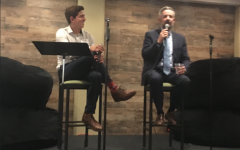 You get to advocate for the patient and really care about the person,” DeWeerd said. He noted that people often have misconceptions about nursing as a profession. Nurses are not just doctors’ assistants; they’re an important part of a healthcare team that operates on a different professional model than other medical professions. Each part of the team respects each other and relies on the expertise of others. “In the hospital, doctors ask nurses about things all the time. No one ever says ‘oh, you’re just a nurse.’ That’d be totally inappropriate,” DeWeerd said. During his time in Calvin’s nursing program, he has never felt discriminated against because of his gender. He noted that, in many ways, women face more challenges in nursing than men. 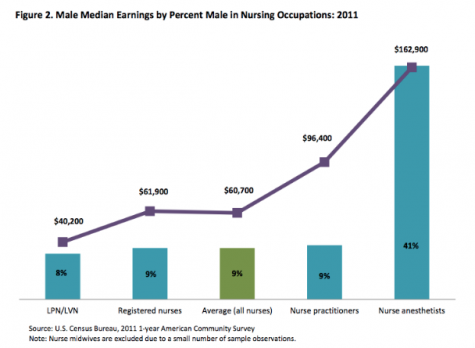 Although women outnumber men nine to one in the field of nursing as a whole, men on average earn more than women in all nursing disciplines, according to U.S. Census Data (see graph below). Most male nurses work in higher-paying nursing specialties such as critical care, emergency medicine, and as nurse practitioners and nurse anesthetists. Would like to point out that the statistic “14 out of 64” is incredibly inaccurate. Each nursing class has 64 students. There are currently two nursing classes, one of juniors and one of seniors, each with a population of male students. Discounting this makes you look ignorant and pushing your own story, and should be clarified to create legitimacy for this article. I would agree with Claire. I would also like to point out that, yes there are, in some cases a wage gap. However, your data does not show, or prove this and is very much pushing an agenda. It is true the male nurses take higher paying positions. No, that does not mean that women can’t do them as good or better then male counters.